The weather here in San Diego has cooled down considerably and I've made plenty of fall-ish recipes (pumpkin bread, shepherd's pie with butternut squash instead of mashed potatoes - so good by the way) and thought, "this baby's coming any day so I better get this house decorated while I still can!" I ran into Michael's to see what they had for cheap fall decor. Not much. 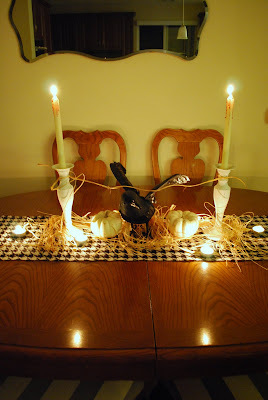 But they did have these awesome black crows that were only $5 and I bought a few candles (several parchment colored and one red - for blood effect). Then, on a trip to Ross after that, I found this letter "S" for only $7 (it's 14" tall) and while it's not useful for anything else after Halloween I still liked it. At home, I had some leftover houndstooth wool, some raffia (why did I have raffia? 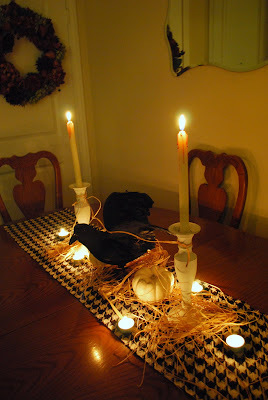 ), a couple of white pumpkins from the local grocer and some votive candles. I also printed a few of these silhouettes that I made onto cardstock and distressed the paper a little. I wanted to frame them but I just couldn't bring myself to make holes in our rental walls just for Halloween. 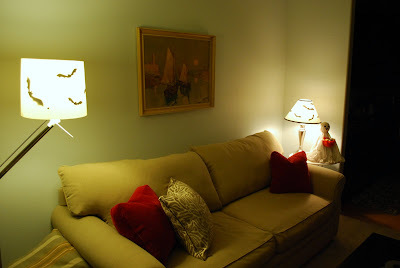 I also cut out a few little bats and taped them inside the lamps for a lighted silhouette effect and cut out several cutouts from Martha Stewart for the walls. Not too shabby. A-Dorable!!! I need to go pull out all of my halloween decor! I wish you were here so we could have another halloween party this year! love the effect of all of the candles. i'm all about chandeliers and spooky candle sticks this time of year. so fun to get into the mood of halloween. You definitely have a gift! 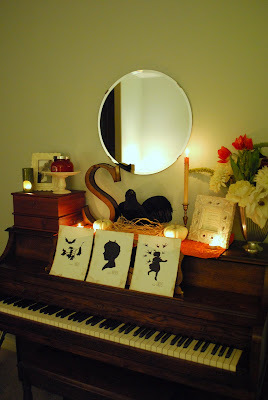 You have me inspired to do a little decorating. looks like someone is nesting! Can't wait for you guys. Get some rest!! I love it all Lizzie and you can surely use the "S" at Christmas time for SNOW and Santa! 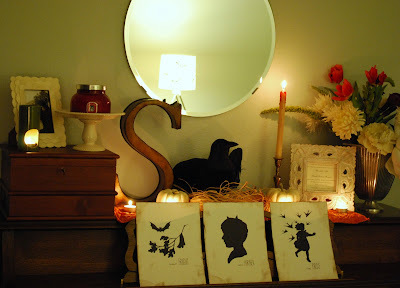 I'm having a Halloween party and I'm going to use your bat silhouette idea! Luv the houndstooth. I'm a sucker for houndstooth. so happy it's back. also, am I an idiot? what is the S for? Spooky? Stupid cousins? Simplify? I feel lobotomized today. You are so talented! Come decorate my house! I'm in such a rut!!!!!! !